Democracy has been disrupted by capitalism to the point of near extinction. Isabelle Ferreras proposes a simple, yet revolutionary solution: democratizing capitalism. For generations, workers have been viewed as human capital, and firms as private economic organizations. Starting with the sociological observation that workers expect to be treated as full citizens, and drawing on the history of Western democracies, this book argues that workplaces are part of the public sphere, and that firms can only be fully understood in that light – as political entities in need of democracy. Examining political revolutions since Roman Antiquity, Ferreras identifies a “bicameral moment” that was the lynchpin of their successful democratic transition, and argues that the time has come for corporations to undertake this transition in a bicameral moment of their own, by granting the same rights to workers – firms’ labor investors – as the ones held by capital investors. Economic Bicameralism, the book’s central idea, is a revolution that is no less political or powerful for its quiet efficiency. Once read, the idea cannot be ignored: firms are political entities with global impact, and must be governed as such – democratically. RVH/Journal Le Monde – Blois, France – Octobre 12, 2018 – A qui appartient l’entreprise ? Point Culture Bruxelles – Octobre 4, 2018 – Gouverner le capitalisme ? by Jean-Philippe Deranty, 2019, Critical Horizons. A Journal of Philosophy and Political Theory, forthcoming in print. 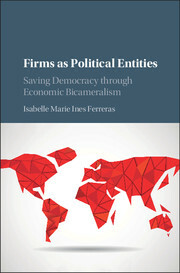 « Isabelle Ferreras’s book presents an exciting and intriguing proposal for the reform of corporate organization and decision-making: that private firms should be modeled along the lines of bicameral legislatures, with an upper and lower house consisting of representatives of owners and workers respectively. An agreement of majorities of both parts would be required for any major corporate decision. Ferreras details the mechanics of this proposal, discusses its advantages, and answers anticipated criticisms of the scheme.